Quick update today. 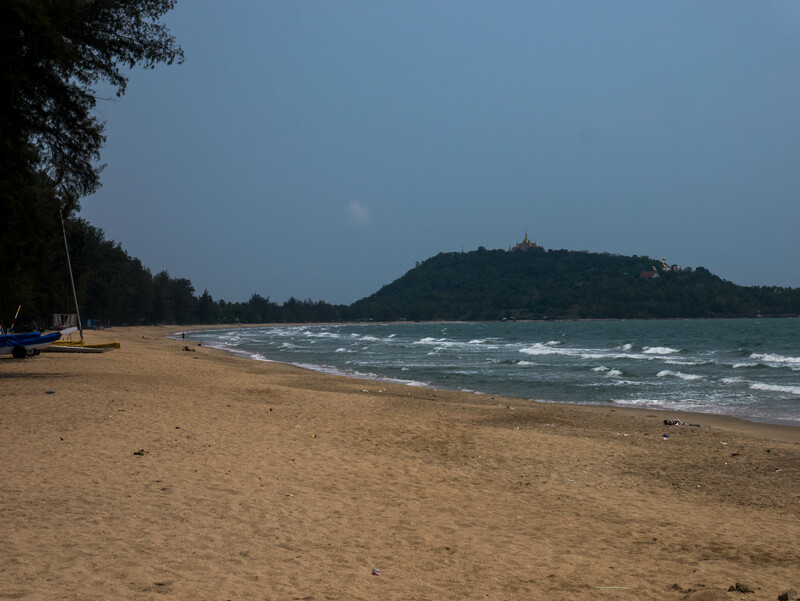 Sophie and I have made it to Prachuap Khiri Khan, which is a small, sort of touristy city on the Gulf of Thailand coast. We’ve sort of settled into a nice beach camping routine, and we spend most of our nights doing just that. We take a day in a hotel every once in awhile, but it’s really hard to beat the stunning beach spots that we’ve been able to camp at. Ditto to the roads that we’ve been riding along, and the food that we get to eat every day. In the end, there isn’t too much to report from this part of the journey but good things. We’re almost over 700km in, and probably about 2-3 days ride from where we’ll bus into Bangkok. The peninsula leg of the trip is almost done, and we plan on celebrating with a moderately priced dinner when we reach Bangkok. 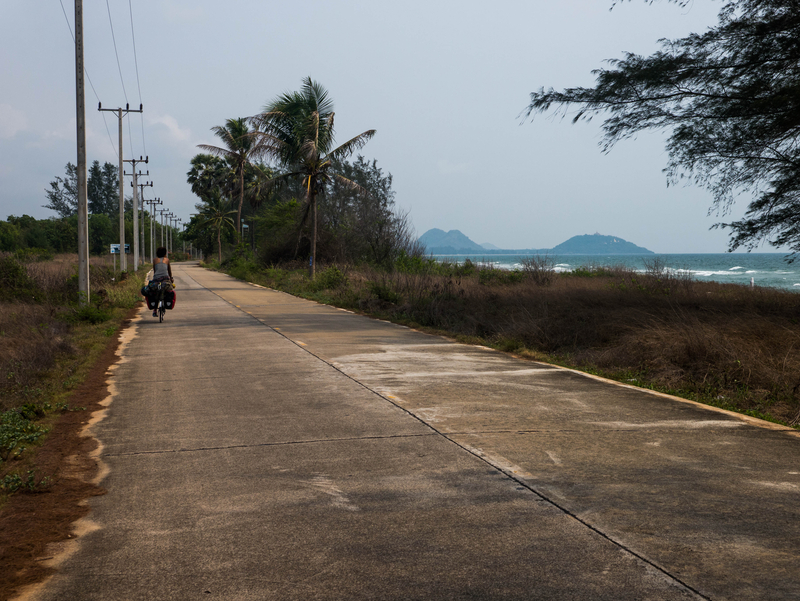 The rolling hills have slowly disappeared, and most of our riding has been done on flat coastal roads, sometimes right along the beach past big resorts and hotels. That is, except for today, when we found ourselves riding on the large shoulder of a main highway. After about 3 hours of breathing vehicle fumes, we’re both feeling a little queasy. We were fortunate to have a meal with two other pairs of bike tourers from the Netherlands and France during one of our rest afternoons. Christopher, from the Netherlands, was quite a character. If I remember correctly, he has cycled through every American state, European Union country, South America, and Russia. The young couple from France was on their first tour, having cycled around Southeast Asia, finally ending up here. Both of the couples told us… exciting things… about the dust that awaits us in Cambodia and the hills that await us further along the road. In addition, we have met one Swiss cyclist and one Spanish cyclist. These encounters are all very exciting to me, as they did not happen with such regularity on my previous trip. Statues everywhere. We’ve left the predominantly Muslim areas behind, and haven’t seen a mosque in about a week. Lord knows what happens here. I have some notes about touring through Southeast Asia, for those of you who come across this blog in the future and are looking for the answers to some basic questions about the area. Sophie and I have come across cyclists who ride later into the day in this season than we do. Sometimes until 2-3pm, which seems borderline unbearable to us. It is true that March is not the optimal time to be cycling through Southeast Asia. But if you do choose this time of the year to do it, don’t plan on riding late in the day unless you are physically prepared for it. The sun is very hot and very bright on most days. We tend to get up at around 5am, for a departure right about when the sun rises at about 6:15-6:30. Early morning is an awesome time to ride in Thailand, with most Thais going to the market and getting other errands done. We’re able to put in a good 4-5 hours of combined snack/riding time by around 10am, and then we find a good place to hang out for the day. At around 4pm, the sun is low enough that we continue if we want. We usually put another good 1-2 hours of riding in during this time. We have ridden later in the day once, but it was almost unbearable for both of us. Lots of water is essential, which brings me to the next point. Water is not a concern. There are 2-3 minimarts every kilometer selling bottled water, and in every larger city there is usually a machine that will give you upwards of 5 liters for 5 baht (like 15 cents). I usually go through about 3 liters of water per ride, but could be drinking more. 7-Elevens are everywhere here, and if you would like to cool off for a few minutes with some A/C, some ultra-sugary Asian drink like knockoff Gatorate (Sporade. It’s gross. ), or some ice cream, then this is where you can do that. Thai minimarts also usually sell ice cream, and the markets in every town sell fresh fruit, none of which has made either of us sick yet. Less than 50 cents for a big clump of bananas (in season right now), about 30 cents for an apple, and about $2-3 for 4 pieces of fried chicken and two packs of sticky rice. No fresh bread though, as Thailand was not a French colony. 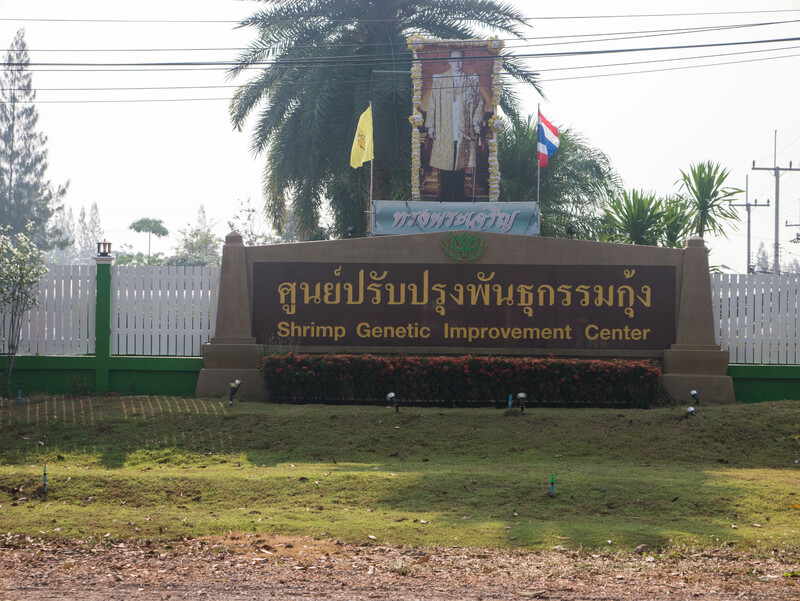 We are looking forward to Cambodia and Vietnam for this. Carbo-loading will become much easier. Q5. 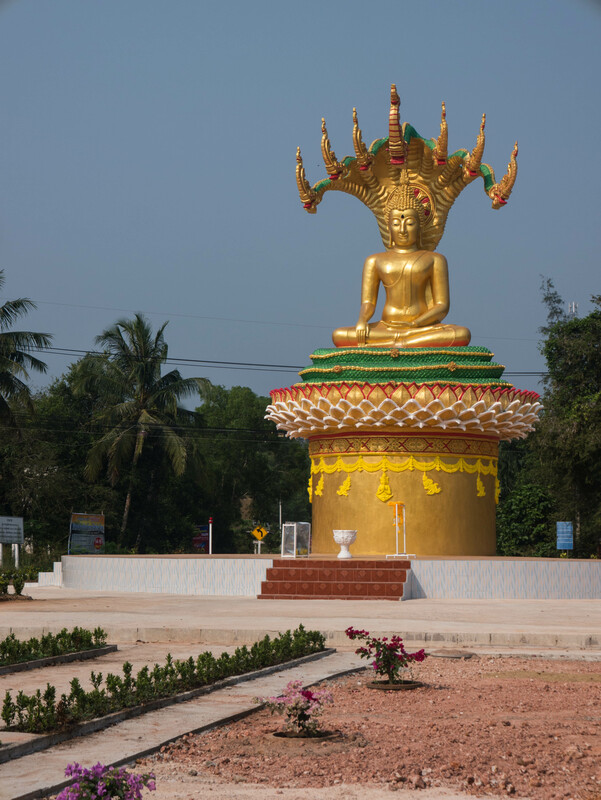 You are on a bike tour in Southern Thailand. Assume for simplicity that over the 800km journey you stop at 20 7-Elevens to buy water. 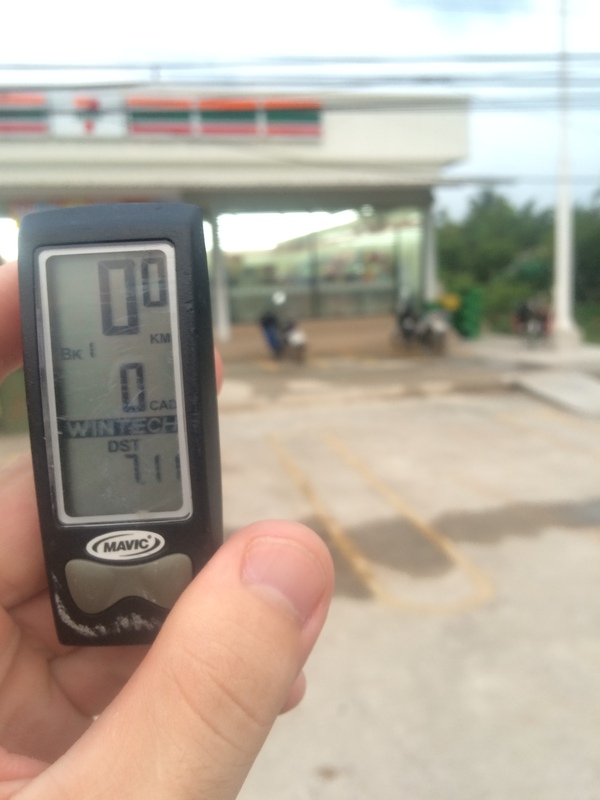 Given that you ride 50km/day, what is the probability that on a given day you stop at a 7-Eleven when your odometer for the day sits precisely at 7.11km? Roads have good surfaces here. All are paved or concrete. Main highways have one number down to smaller regional roads that have four numbers. Stick on the four-numbered roads, as they have less traffic and still a good road surface. Road numbers do not correspond between Google Maps and real life, but the relative size of each road does. While a road may have a different number than on Google Maps, it is still usually a local highway good for riding. The main highways are exhausting to ride on, mostly because you just have to keep your head on a swivel the whole time. Motorbikes zoom past, trucks spit pitch black exhaust in your face, and carts often go the wrong way. Fortunately, on these big highways, there is always a very large shoulder (5-6 feet) basically built for cyclists and motorcyclists. There is a large cycling culture down here, and we have passed countless Thais going on morning rides. Down here, I find myself largely navigating with the sun anyways. So close the equator, the motion of the sun through the day is very predictable, and finding your cardinal direction using it is simple. It rises perpendicular to the east side of the peninsula, and sets perpendicular to the west side. I’ve made two wrong turns at this point, both in part resulting from not noting where the sun was. 7 days to leave the country or Sophie is here on borrowed time. Until next time.